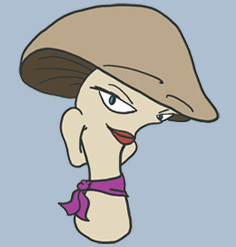 Bella is a portabella mushroom or agaricus bisporus. She is one of Cap’s cousins. She is also Minnie’s big sister. Bella is very shy and quiet. She is also very friendly and enjoys spending time with her friends. Bella is graceful and elegant, and uses these skills in her favourite activity, dancing. Bella hopes that one day she will become a nurse.